essentials, you’ll see that the problem with only having this type of list is it doesn’t give you much direction in terms of style. 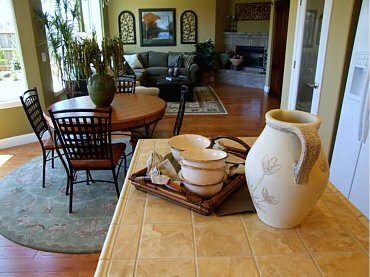 Decorating becomes much easier when you have identified the decorating styles that you want to feature in your home. If you like a certain style then you can adopt the characteristics of that interior design style when it comes to choosing fabrics, colours and even furniture. The result is harmonious and pulls the whole room together. The style or styles you choose become a guide that you can refer to whenever you shop for - or plan your room’s decor. Once again your picture collection will come in handy. You might find that your answer is already there. If your decorating pictures strongly feature certain interior design styles then it is a safe bet that that style is for you. If this is the case for you and if you want your home to be completely true to the style then follow all the rules for that trend: use the correct fabrics and colours, find out more about what inspired the style and the history of that look. What if you can’t see any real trend towards a particular style? That’s also fine - maybe you like elements of several styles. Go through your picture collection and see if you can identify what it is that works for you. Are you picking up two or three distinct styles instead of just one? Perhaps you love a stark industrial style backdrop, but then want to shock the eye with Victorian furniture pieces. If you are noticing multiple interior design styles that you would like to blend then do that carefully by borrowing enough features from each style so that you have a certain look and feel to your room. In this case, people will usually describe your décor as eclectic - a mix of more than one style. You’ll find that there are really a lot of interior design styles with frequent overlaps of the different styles. Don’t try too hard to fit what you like into one style-box if you like a combination of styles. I’ve mentioned some of the interior design styles, but this is by no means an exhaustive list. Remember that all these decorating styles are just about giving you a guide to a co-ordinated look. Click on the name of the style (link) for more information about the features of each style. The Tuscan, French and Country styles are very similar, in that they embrace a simple lifestyle. There is some overlap here with the Mediterranean style - due to the Italian and Spanish influences, but this style also features hints of the Moroccan style of decor. If you want a more feminine or Cottage style then shabby chic may be for you. However, if you are looking for something feminine with a little more structure you may prefer the Victorian look. If you can’t stand the clutter, try a Minimalist style - you can take it into a more masculine direction with the Industrial style, or perhaps embrace a neutral look with a contemporary finish. Maybe you’d like an earthy style without a country feel - African style could be for you. instead - this is a highly personal way of styling your home. It is more about you and less about recognised decorating styles.